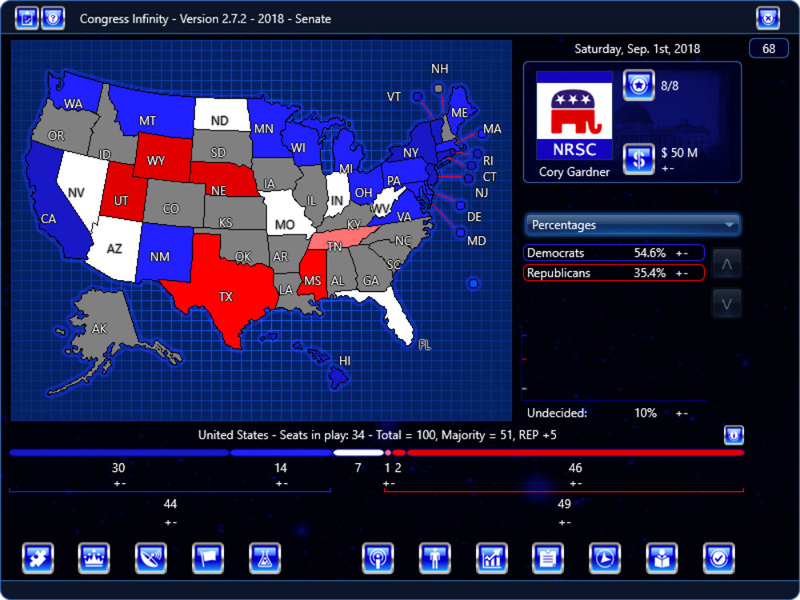 Here’s how the Senate 2018 campaign looks in the game currently. At this point I’m putting Gov. Rick Scott in Florida, and so making that race 50-50. If he doesn’t run, it will probably be shifted to 55-45 for Nelson. Note that in North Dakota, although Cramer is a Representative, his district covers the entire state (‘at-large’), so the dynamics of the race are a bit different from a typical Representative. Maine and Vermont are currently blue because Sanders and King are effectively Dems, but for game play purposes they might be made into Independents. Note in the game the following states start 55-45. All of these incumbents are Dems, with the exception of Maine, where King is an Independent. Maine and Vermont should be independents as it’ll create a more realistic scenario. I don’t know if this is possible but here’s a suggestion, perhaps start the independents in a non agreesion pact /collation as the independents caucus with the Democrats. Agreed. King and Sanders should be Independent Democrats. But I also think minor parties should be added to the scenario. I agree with all of your tossups (including the Scott scenario, in which Nelson is at 55% if Scott doesn’t run). My prediction is that in these toss-ups, Democrats run the table. However, I wouldn’t be surprised if Scott wins FL or Heller keeps NV. These are all true tossups, meaning I wouldn’t be shocked either way these elections went. Yes, they will probably be set as Independents in Coalition with the Dems, unless the Dems run serious candidates against them. I’m looking forward for this update. Where do you get the region percentages from? I’m guessing there’s no poll data in yet. I’ve always thought that polling data is too influential in the game. The %s come from real world polling combined with best guesses or, where that doesn’t exist, results from recent elections in that region.